Doug Ghim gets interviewed by Fox TV’s Holly Sonders after advancing in the U.S. Amateur. 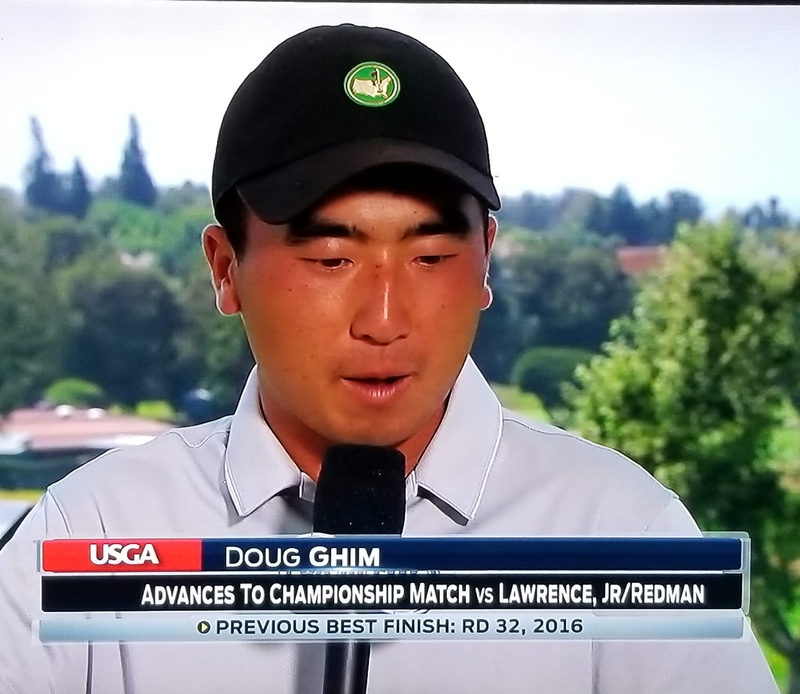 Doug Ghim is already one of golf’s most inspiring players, no matter how his 36-hole championship match in the U.S. Amateur turns out on Sunday. Ghim, who grew up in Arlington Heights and ranked No. 5 academically in his graduating class at Buffalo Grove High School, was a 2 and 1 winner in his semifinal match with Theo Humphreys, a Vanderbilt University golfer, at famed Riviera Country Club in the Los Angeles area on Saturday. His opponent on Sunday is Doc Redman, the runner-up in the Western Amateur at Skokie Country Club two weeks ago. Redman, from Raleigh, N.C., is a sophomore-to-be at Clemson. He defeated another collegian, Mark Lawrence of Virginia Tech, 1-up in his semifinal. Both Ghim and Redman will elevate their profiles dramatically through their nationally televised duel (Fox Sports, 3:30 p.m.) in California. U.S. Amateur finalists traditionally get invitations to the Masters tournament and U.S. Open as well as other choice competitions. That underscores how Ghim’s career in golf’s big-time golf is just beginning, and the way he got to this point is a story well worth telling. Ghim’s father Jeff got him started in golf when he was six years old. Back then it was all about practicing, not scoring. Jeff had wanted to be a professional golfer himself, but three back surgeries ended that dream. He did, though, see considerable promise in his only son. An invitation to play in the 2018 Masters is expected to be in Doug Ghim’s future. The Ghims couldn’t afford the private clubs in the area. Instead father and son played the more affordable public courses, especially the Arboretum layout when twi-light rates were available. They weren’t above fishing golf balls out of water hazards at times, either. Jeff has been Doug’s only swing instructor and is his caddie at Riviera. 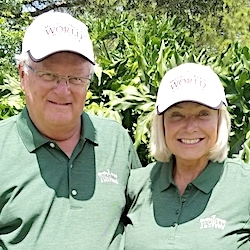 “I’m sure there was financial stress, but I think more than anything he wanted to see if I actually loved the game,’’ Doug told the assembled media after his semifinal victory on Saturday. The answer was a resounding “Yes!’’ Doug loved the game and worked to get better throughout his high school years. He didn’t play for the school team after his freshman year because the Ghims felt there were better growth options in national junior tournaments. He didn’t take the usual path to the pros by making a mark in the two biggest state events – the Illinois State Amateur and Illinois Open – either, but he still earned enough notoriety to land at a college with a top golf program. Though nearby Illinois and Northwestern also had strong programs, Ghim wound up at Texas a year after Jordan Spieth departed that school for the pro ranks after one college season. Jeff was giving golf lessons at the since closed Golf Nation indoor facility in Palatine then and Doug’s signing announcement with the Longhorns was held there. Only two media members showed up. I know. I was one of them. With Spieth gone, the main teammate to look up to for two years was Beau Hossler. 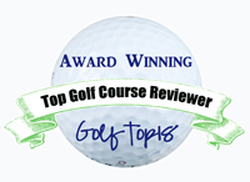 In previous years Texas had such stars as Ben Crenshaw and Tom Kite. Now Ghim, at 21, is the man. Before his strong showing at Riviera he won the Pacific Coast Amateur so his game is peaking at a good time. His final collegiate season may be delayed a few days because the U.S. Amateur champion gets an automatic berth on the U.S. Walker Cup team, and the U.S. Golf Association will pick nine others to play against the European team next month. Ghim looms as a good bet to make that team one way or another. If he does win today he’ll be part of collegiate golf history. Another Texas student, Sophia Schubert, won the U.S. Women’s Amateur this year and no school has ever swept both the men’s and women’s titles at the national championship. Ghim’s headgear at Riviera is also noteworthy. He wore a Masters cap during his semifinal match and will wear a Cubs’ cap in the final.